Oh thank you! I had thought to try that for Utta but hadn't ordered any yet. Sorry OP, done hijacking your thread! She is jut beautiful! I loved your box opening video! Congrats! on a gorgeous doll. If I ever had the $$$ they would be on the list. By the way, the video was great. Dina It's a slippery slope! I know I'm already headed that direction! oops! allurose Hijack away! 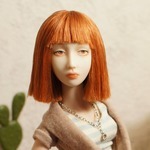 Clothes are a conundrum with these specialized artist dolls. She doesn't quite fit a Slim MSD 1/4. That dress was a Minifee dress and it doesn't close up the back properly. I bought it because it was very inexpensive and I wanted to try the size. I have a fabulous woman making me two outfits for her, and I'll have one soon so I'll have more photos to provide. It's hard to find the right fit. She does fit MSD shoes perfectly though. EarthShine Doll I'm so glad you enjoyed it. I couldn't find one for many porcelain BJDs and I would have loved to watch them, so I figured, why not? caracal Thank you! I'm partial too! carmenke Thank you! She's a great doll and I definitely want more by the artist. Worth the money but it's a lot to save for that's for sure.